This is a fan club only release from the Elvis specialty label, Follow That Dream (FTD) records, but I just had to add this in anyway, as my excitement level is going through the roof! I have been waiting for this with bated breath now for almost 10 years, and now I finally have it in my greedy little hands. WOW!! That sums this package up perfectly. This is the ultimate Elvis product for a fanatic like me. My favourite era for Elvis is the 50’s, and especially his short tenure at Sun records from 1954-55. You can feel the birth of rock’n’roll right in the grooves of those Sun records …. listen as Elvis and the Blue Moon Boys (Scotty and Bill) create their fresh twist on rhythm & blues, jump blues and country, merging styles and revving it all up … turning into something quite different from everything else out there at the time. This package is a monster. It’s very pricey, but for an Elvis nut like me, I didn’t even flinch at the $150.00 price tag. 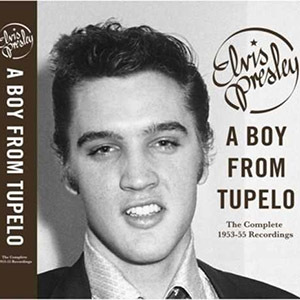 The whole thing is packaged in an 11” x 11” (or so) box, housing a CD folder which contains three discs of everything Elvis recorded at Sun from his first private acetates in 1953 to his last recordings at the label in ’55 before moving onto RCA and superstardom. Well, everything that has survived that is, including all the master takes, a plethora of outtakes of the boys in the studio working away on various songs and a number of live recordings, mostly the Louisiana Hayride shows from the time. The sound quality on all this is probably the best it’s been ever before, even on the scratchy and distorted live recordings that have thankfully been preserved. Elvis practically jumps out of the speakers at you in all his “Memphis Flash” glory. This is the birth of rock’s biggest legend … the first star of the rock’n’roll era and the undisputed King. But, the main point of this package isn’t necessarily the music, most of which we’ve had before on many releases. This is mainly a book project … and a hefty one … over 500 pages and weighing in at over 8 pounds (if memory serves). This book is loaded with photos from the era, and a number of them very rare and new to my eyes … from professional photographs to snapshots taken by fans … some blurry, torn and faded, showing the wear and tear they’ve endured in the nearly 60 years since they were taken. This book also tells the story of Elvis at Sun written by Elvis guru and catalog savior Ernst Jorgensen, with loads of stories from the people who lived through it all. I haven’t read through it all yet (taking my time with this baby), but for any aficionado of early Elvis, this is the ultimate … the most complete package of those immensely important years in the history of The King, and of rock’n’roll itself! Score : 10 out of 10 … can I give it even higher marks? It doesn’t get better than this!